How can you ensure that a project succeeds? Truly, you can’t. But if you work to build thick networks amongst participants, you’ll have a better chance of success. Sometimes, our work is not as successful as we hope it will be. But that’s okay. It means that we have learned something as an organization and those learnings help us improve our work. Using our failures as opportunities for growth help us make sure the next time we launch something new, it will be a success. Recently, we discovered first-hand how important "thick networks" are when it comes to ideating and implementing new placemaking initiatives. 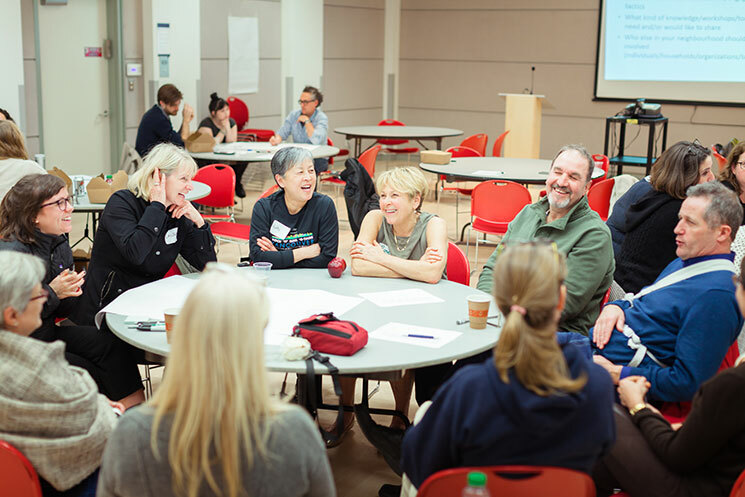 This is one of the goals of Evergreen's Green Bloc program: neighbourhoods that come together to think about their ecological footprint but end up discussing other goals for their community, such as new ways to connect while creating environmental and social resilience. 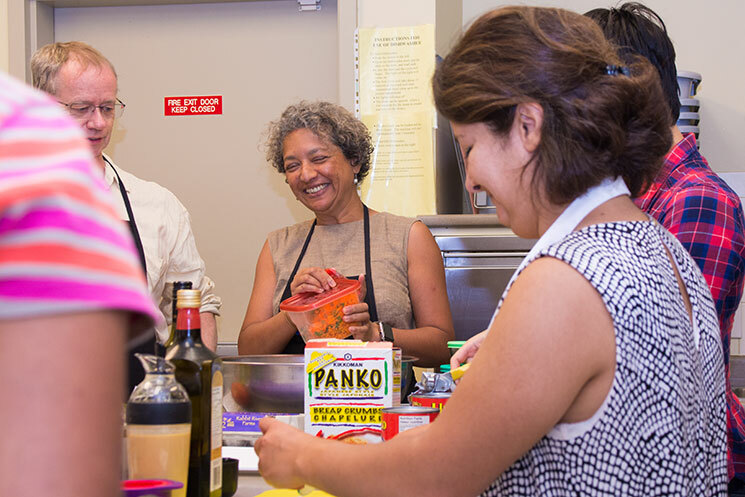 Cooking workshop in Vancouver's West End neighbourhood. Green Bloc has been very successful in neighbourhoods where this type of network already exists, whether through sports, school, church or a mixture of those and more. Where Green Bloc has struggled are neighbourhoods in which that underlying connection doesn’t exist. Occasionally, community members are meeting for the first time through our projects. While that is a great thing, it makes it harder to form a base upon which a network can grow. For a project like Green Bloc, which can span one year and beyond, it can feel like too much to take on for someone getting involved in their community for the first time. Thick networks are created by being low-barrier and low commitment. People need to be able to participate at different points in the process. To ensure success amongst placemaking projects like Green Bloc, participants often have to build up their involvement rather than diving in headfirst from the start. Within our work, the two neighbourhoods that struggled the most with the project both had participants that were more likely to live in apartments or condos. Unfortunately, in these neighbourhoods, only a small number of participants chose to continue to participate in the project past the initial dialogue phase. We felt that they needed more time to get to know each other on multiple levels before they felt ready to commit to a project that was expected to last a year or more. Green Bloc workshop in Vancouver's Dunbar neighbourhood. Alternately, the neighbourhoods where Green Bloc has flourished are ones that are mostly single-family homes, where participants own their homes and have lived there for a number of years. This was most likely due to their existing sense of community and multiple points of connection. Using these learnings help us craft better ideas for projects to come. To foster successful engagement, we can’t be afraid to take the time needed to build those thick networks. Often we can feel rushed because of funding cycles, upcoming deliverables, or even our own project goals, but we owe it to the participants to create a project that treats their time and commitment with respect. Thick networks don’t appear overnight. They take time and work and creativity. But once they’re established, you can create more impactful, successful projects for all. Green Bloc is supported by the City of Vancouver, Vancity and the Sitka Foundation. Learn more about Green Bloc.